Ribbon schematic (hand drawn & colored, in 1981) of the 3D structure of the protein triose phosphate isomerase. The barrel of 8 beta-strands is shown by green arrows and the 8 alpha-helices as brown spirals. By Jane Richardson. 1.30 p.m. Amy Zalman. Strategic Narrative Institute. Activity. 3.30 p.m. Ethan S. Burger. Cyber War: How Russian Hackers and Trolls Helped Elect a President. 3.50 p.m. Lee Gutkind. Creative Non-Fiction. Activity. This workshop seeks to provide a platform for multidisciplinary perspectives on “data”. Digital data has traditionally been defined as “bits and bytes”; it was not information, and it was not knowledge or wisdom. There is no doubt that data drives decision making in corporations; a process of transformation into something other than bits and bytes sheds light on short term and long-term structural objectives. Today there are machine-to-machine communications, without a human in the loop. What are some of the social implications of such systems? What is the role of the human in an increasingly technocratic society? How can we leverage data for human and environmental sustainability? How is narrative important to our future(s)? Importantly, we consider how data is being used today (both in open and closed systems); we consider warrant-based and warrant-less tracking capabilities in the context of commercial enterprise, open government systems, and for national security in general. What will happen when data begins to become “aware” of itself, its place in a chain of transactions, the metadata linked to it, and where it is “fit for purpose” (or not fit for purpose) contextually. The Workshop seeks to question how forms of structured and unstructured datasets can be used, or should be used and begins to shed light on the power of data to “be” in and of its own accord. This is contrasted against today’s corporatisation of data “behind a gateway”, the commoditisation of the individual, and fundamental consumer data rights as opposed to business and government data rights, and algorithmic bias driven by data. The Workshop will invite stakeholders of all types to participate in activities, allowing them to return to their workplaces to ask the same questions and the same challenges elicited in the Workshop. We hope you can join us. We look forward to your participation. Data are facts and statistics collected together for reference or analysis. Merriam-Webster: 1: facts about something that can be used in calculating, reasoning, or planning. 2: information expressed as numbers for use especially in a computer. Oxford Dictionary: Computing: the quantities, characters, or symbols on which operations are performed by a computer, being stored and transmitted in the form of electrical signals and recorded on magnetic, optical, or mechanical recording media. Philosophy: things known or assumed as facts, making the basis of reasoning or calculation. BusinessDictionary.com: Definition of data: Information in raw or unorganized form (such as alphabets, numbers, or symbols) that refer to, or represent, conditions, ideas, or objects. Wikipedia: Data is a set of values of qualitative or quantitative variables. Data and information are often used interchangeably; however, the extent to which a set of data is informative to someone depends on the extent to which it is unexpected by that person. Collins English Dictionary: 1. (Communications & Information) a series of observations, measurements, or facts; information 2. (Computer Science) computing Also called: information the information operated on by a computer program. Dictionary of Military and Associated Terms: Representation of facts, concepts, or instructions in a formalized manner suitable for communication, interpretation, or processing by humans or by automatic means. Any representations such as characters or analog quantities to which meaning is or might be assigned. Abstract: Location is fundamental to every interaction that happens on Earth. Increasingly, the personal and work-related smart devices we use are packed with sensors that record the who (ID), where (location), when (time), and how (mode of transport/condition) of a user’s daily chronicle. Both commercial initiatives and law enforcement motivations have been responsible for generating big data for user convenience and security purposes. This presentation will address issues related to law, regulation and policy as they pertain to real-time monitoring and tracking of things and people, that we have called uberveillance. We consider colliding stakeholder perspectives in demonstrated case law, in the race to go beyond intelligence toward evidence, and ask fundamental questions about the rights of citizens. Is the warrant search process broken? Are service providers keeping too much information? How do citizens maintain their privacy? Social, technological, legal and ethical principles and processes will be highlighted throughout this case-based talk toward a holistic approach to information management in practice. Bio: Professor Katina Michael is the Director of the Center for Engineering, Policy and Society in the School for the Future of Innovation in Society at Arizona State University. She has a background in telecommunications engineering, and has completed an information technology and national security law degree. She is the founding Editor-in-Chief of the IEEE Transactions of Technology and Society. In 2017, Katina was awarded the Brian M. O'Connell Distinguished Service Award in the IEEE Society on the Social Implications of Technology. Abstract: Technology advances, including an unprecedented explosion of human data, information and knowledge, are accumulating and accelerating at a rate so fast than perhaps not even the world's top experts can appreciate. This is driven by well understood exponential factors such as Moore's Law, but becomes algorithmic when compounded by advances driven by increasingly networked systems (Metcalfe's Law), leaps in software architectures (Nathan's Laws), a continued doubling of human knowledge and data 'Fuller's Law', and revolutions in computing architectures (Bell's Law). These advances are so fast, disparate, complex, and unprecedented that few have been able to step back and look at the opportunities and challenges represented by the emergent properties of this current environment. What does this mean for the human condition? How does the act of being "alive" change in the face of these dynamics - not in 50 years, 20, or 10, but now? How can asking this question draw our focus towards and begin to shape more optimal strategies for creating, interacting, or thinking about the data around us today? This talk will expound on these drivers and questions. Video: Pat Scannell and Bob Cook-Deegan give their opening keynotes with discussants interrogating deeper questioning. Length 2 hours 6 min. Abstract: When the idea of sequencing the human genome was independently proposed by three different scientists in 1985, the debate quickly focused on whether it was a fantasy or a real possibility. The completion of a reference genome in 2003 marked two transitions: one was to introduce an era of hyper-Moore's-Curve technological change, with DNA sequencing dropping in price and increasing in speed by 6 orders of magnitude in a decade. The second transition was a shift from viewing genomic data as an end—the reference sequence—and instead becoming a means for understanding the meaning of genomic variants. Sequencing has become ubiquitous, with millions of individual people having had their genomes sequenced in whole or in part, and tens of millions in prospect over the next decade. Sequencing has also pervaded the study of and biotechnical applications of living organs, not just humans. What does the future hold? One prospect is great promise, for example finally understanding the cellular mechanics of cancer, and indeed being able to detect and manage risk before cancer occurs. This would entail understanding with variants are disease-associated and which are not, a daunting technical task that necessarily involves sharing data globally among many kinds of institutions—nonprofit and for-profit, labs, clinicians, individuals, families, health systems, and public and private research institutions. But who will build and sustain this knowledge commons? There are also significant risks. The information is exquisitely private, bears not only on an individual but on others related to that individual, and uses are not just in medical decision-making, but also in DNA forensics, ancestry-tracing, population surveillance, and others. Real risks include online and face-to-face harassment, blackmail, and cyberbullying based on scraping of highly private online data. The privacy stakes are high, but protections weak and subject to corporate incentives that do not align with the rights and interests of the people putting their data online. Both the promises and perils will be illustrated by concrete and current example of sharing data about cancer-associated variants, a nascent global data commons that also confronts the real vulnerabilities and risks of currrent platforms and business practices. Biography: Bob Cook-Deegan is a Professor in the School for the Future of Innovation in Society at Arizona State University. He studies biomedical innovation. He has been involved with BRCA since 1990, and was involved in early discussions about the gene-patent case, Association of Molecular Pathology vs. Myriad Genetics, that proceeded to the Supreme Court. As a policy advisor for this project, Bob would help this team to navigate a complex data-sharing policy landscape that is rapidly evolving. Biography: Andrew DuFresne is a science educator, communicator, and consultant. He is a member of the faculty at the Foundation for Advanced Education in the Sciences (FAES), the graduate school of the National Institutes of Health (NIH). He also teaches students one-on-one for the boutique education firm PrepMatters. Having seen constant and promising connections between tailored communication approaches and improved subject matter comprehension and participation, Andrew is developing the Integrated Scientific Inquiry and Engagement Consortium (ISIEC). ISIEC is a trio of programs aimed at creating new content and analysis in the areas of science education, communication, and consulting and with a focus on the intersection of science and society. Andrew teaches students located all over the world in subjects including biology, chemistry, physics, environmental science, and math from introductory through advanced levels. He also teaches science communication and teaching skills to undergraduate and graduate students, postdocs, and established clinicians and researchers. Over the course of his education and career, Andrew has contributed to an array of projects in various disciplines: the societal impact of Mars exploration for NASA, training scientists on the use of robotics in the lab for Johnson & Johnson, novel cancer radiotherapies involving viral activation, science communication workshops for George Washington University and Research!America, content and design review for popular science YouTube series and national science meetings, and how to improve the engagement of engineers around the country with policy decisions for Tau Beta Pi, the national engineering honor society. Andrew is also the President of the Washington, DC Alumni Chapter of Tau Beta Pi. He holds a Bachelor’s degree in Biochemistry from Worcester Polytechnic Institute and a doctorate in Biochemistry, Cellular, and Molecular Biology from the Johns Hopkins University School of Medicine, with research experience in virology and pharmacology. Abstract: Data are commonly represented as numbers. What do numbers mean? What do numbers tell us about the correspondence between our ideas and the world out there? What do numbers tell us about data quality? I will use several examples to explore the different things that quantitative renderings of facts and phenomena—numbers—may actually be telling us—and hiding from us. To describe something with a number is to make a claim about a direct correspondence between the thing being represented by the number, and the real world out there. However, many numbers are the product of trans-science (Weinberg, 1972): they purport to use science to answer a question that cannot be answered scientifically. Such numbers may serve vital social functions, but it is unclear what they actually tell us about the world. Because such numbers inappropriately borrow cultural status from conventional science, Democracies need to cultivate competition, from other sources of imagination, to the numbers of trans-science, to assure that the public imagination—and thus our options for the future—are not constrained or stunted. Biography: Daniel Sarewitz’s work focuses on revealing the connections between science policy decisions, scientific research and social outcomes. How does the distribution of the social benefits of science relate to the way that we organize scientific inquiry? What accounts for the highly uneven advance of know-how related to solving human problems? How do the interactions between scientific uncertainty and human values influence decision making? How does technological innovation influence politics? And how can improved insight into such questions contribute to improved real-world practice? His current activities include a project (with writer Lee Gutkind) on harmonies between science and religion. Sarewitz edits the magazine Issues in Science and Technology, and is a regular columnist for Naturemagazine. His article “Saving Science,” a broad assessment of the current crisis of quality and public value in the American research system, appeared in the summer 2016 issue of The New Atlantis magazine. His most recent book is The Techno-Human Condition (MIT Press, 2011), co-authored with Braden Allenby. Visit the CSPO online library for more. From 1989 to 1993, Sarewitz worked on R&D policy issues as a staff member in the US House of Representatives, and principal speech writer for Committee Chairman George E. Brown, Jr. He received a doctorate in geological sciences from Cornell University in 1986. He now directs CSPO’s office in Washington, DC, and focuses his efforts on a range of activities to increase CSPO’s impact on federal science and technology policy processes, and its contributions to public dialogue on the social and political aspects of scientific and technological change. Biography: Amy Zalman is a global security futurist, author, speaker and professor. She founded the Strategic Narrative Institute in 2017 to help people anticipate the impacts of critical global trends to plan more effectively and capitalize on changing conditions. Services include strategy workshops, executive education, keynotes and foresight capacity building. Clients include Fortune 500 companies, growing businesses, civilian and military government agencies, and industry associations and non-profits. She is also a part time professor of Strategic Foresight in the Department of Culture, Communications & Technology at Georgetown University in Washington DC. She is the former Chief Executive Officer and President of the World Future Society and the former Chair of Information Integration at the National War College in Washington DC. Amy is a frequent keynote speaker and has addressed senior corporate and policy audiences on five continents, and regularly publishes on issues related to the intersections of emerging technologies and their impacts on societies, governance and global power. She is frequently cited in the media, and her appearances and interviews include Atlantic magazine, BBC, CGTN, CNBC, Engineering & Technology magazine, Huffington Post, Voice of America, and elsewhere. Amy holds a Ph.D. in Middle Eastern Studies from New York University, a Masters Degree of Fine Arts from Cornell University, a Bachelors Degree from Columbia University. She is a former Fulbright scholar in Jordan, and a former fellow at the EastWest Institute in New York, and has served on the faculties of New York University, Cornell University, and the New School University. Abstract: Had Hillary Clinton done one-percent better as expected in Michigan (10,704, 0.2%), Pennsylvania 46,765 (0.7% and Wisconsin (22,177, 0.8), she would have won the 2016 presidential election. No single factor explains Donald Trump’s victory, but the 24/7 news cycle has revolutionized the way Americans think about politics. Today, 4 in 10 Americans get their news online. Facebook is the most popular social media platform, which along with Twitter may be the most effective tool to influence U.S. voter behavior. Trump supporters insist that Russian “meddling” in the 2016 U.S. Presidential Election had no impact on the outcome; a position which is only justified if narrowly understood to mean the actual mechanics of casting and tabulating votes. Russian [Soviet] “influence operations” are nothing new. What is new is the revolutionary capabilities cyber provides; the use of which from an international law standpoint do not qualify as either an “armed attack” or “use of force.” It should not be overlooked that what constitutes an “act of war” remains a political decision. Under the auspices of the Kremlin, Russian trolls developed, deployed, and operated on a real-time basis a multi-faceted social media campaign aimed at exciting the Trump base and discouraging potential Clinton voters. Even if not formally coordinated with the Trump team, the Russian efforted operated in parallel with it. This presentation analyzes what the Kremlin did and why. It also briefly examines why efforts to counteract similar efforts in the future are likely to fail. He has been a full-time faculty member at American University (Transnational Crime and Corruption Center) and the University of Wollongong (Centre for Transnational Crime Prevention); as well as on an adjunct basis at Georgetown University Law Center, University of Baltimore, and Washington College of Law. He has lectured in Colombia, India and Singapore. He has taught at Vilnius University about cyber issues while on a Fulbright Foundation grant. He is currently an adjunct professor at the Institute of World Politics. He holds a A.B. from Harvard University and a J.D. from the Georgetown University Law Center. Abstract: The story today in politics—and in science, technology, business, policy and journalism—is the story. Everyone, every organization, needs a narrative. Especially when connecting with, informing and influencing the general public. The popularity and usefulness of synchronizing story and fact has become crucial, as the world becomes more complicated and innovation more difficult to comprehend. Lee Gutkind will take us back a half century when stories about two murderers in Kansas and a sickly Frank Sinatra began the literary and journalistic evolution of what is known as creative nonfiction—"true stories well told”--today the fastest growing genre in the publishing industry and in the academy. Essays in The New Yorker, The Atlantic, and many other publications are now mostly narrative. Excellent and effective nonfiction narrative books like Being Mortal or the Immortal Life of Henrietta Lacks are selling millions of copies. But the danger, in our rush to tell a good story, is that the style may take precedence over substance. Story can overwhelm the information. And some writers or speakers simply make stuff up. In the past, there have been gatekeepers and severe penalties for writers who have crossed the line in order to mislead and profit. Today, however, the gatekeepers are mostly gone or have been discredited by the same techniques that they practice and promote: words and story—and not just by Donald Trump and Kellyanne Conway, but now on Broadway. Gutkind will discuss the challenges of true story writing and the decisions writers must make: What are the techniques that writers use or misuse to create interest, drama and suspense to keep a reader captivated and to persuade them to adapt their ideas and act upon them? Can we exaggerate? Imagine? Recreate? Composite? Compress? Where’s the line between fact and fiction? Does it matter anymore? 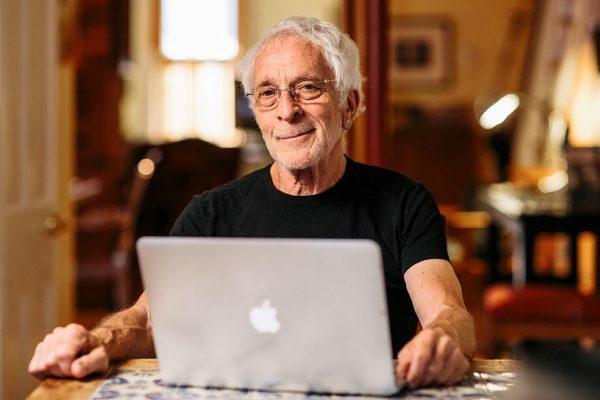 Biography: Recognized by Vanity Fair as “the Godfather behind creative nonfiction,” Gutkind is the author or editor of more than 35 books and founder and editor of Creative Nonfiction, the first and largest literary magazine to publish narrative nonfiction exclusively. He is Distinguished Writer-in-Residence in at the Consortium for Science, Policy & Outcomes at Arizona State University and a professor in the School for the Future of Innovation in Society. Gutkind has lectured to audiences around the world—from China to the Czech Republic, from Australia to Africa to Egypt. He has presented “Writing True Stories” workshops in Washington, D.C. at the National Press Club and the National Academy of Sciences. He has appeared on many national radio and television shows, including The Daily Show with Jon Stewart (Comedy Central), Good Morning America, National Public Radio’s Talk of the Nation and All Things Considered, as well as BBC World. Abstract: The demand for public engagement in upstream science and engineering is fast becoming mainstream. From the National Academies to the European Commission, from geoengineering to gene editing, from artificial intelligence to synthetic biology—there is a growing recognition of the socio-technical nature of the inherent challenges and a variety of calls for earlier and sustained engagement with diverse stakeholders and the general public. Despite a significant increase in the number and sophistication of engagement approaches, institutional and cultural barriers remain, particularly in linking techno-scientific and socio-political discourses. I report on our efforts to use Participatory Technology Assessment (pTA), a method for eliciting informed, deliberative, diverse, and representative public views and values to inform upstream decision-making. I describe the basic three-step trans-disciplinary research design process applied for a pTA project on planetary defense and subsequent innovations in the case of autonomous cars and solar geoengineering. I conclude by focusing on the role pTA can play to bridge the divide between societal needs and expert decision-making. 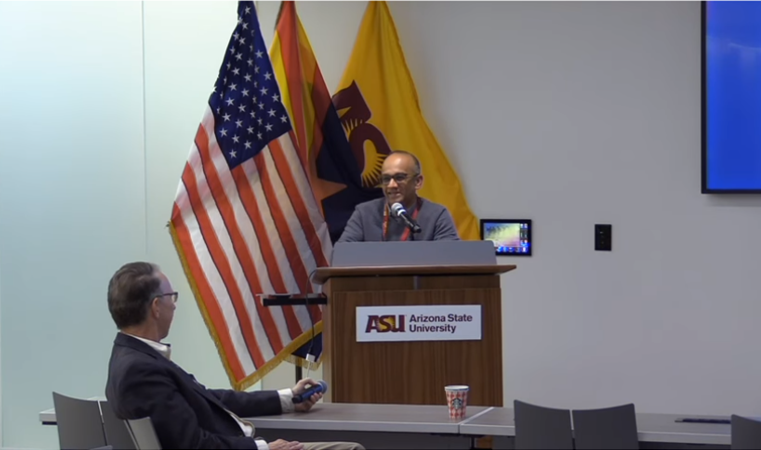 Biography: Mahmud Farooque’s work at ASU’s Washington Center focuses on linking science policy to better societal outcomes. He co-leads CSPO’s long-term efforts to build a community of practice among innovative R&D program managers in the government, non-government and private sectors.These include convening informal and formal knowledge exchanges between program managers about the challenges and opportunities for innovating in path dependent institutions. Mahmud was the Deputy Director of Policy Programs at the New York Academy of Science, Director of Collaborative Research at City University of New York, Associate Director for Research Development at Northwestern University, and Managing Director of USDOT Research Center at Purdue University. Mahmud’s expertise focuses on innovation systems, research management, knowledge co-production, policy entrepreneurship, and participatory technology assessment. Video: Part 2 of the Data Alive workshop. Inclusive talks from Daniel Sarewitz to Mahmud Farooque. Above Mahmud in Q&A with Bob Cook-Deegan. Length 3 hours 43 min. Amy Zalman with Mahmud Farooque holding up a poster on future visions of “Desktop CRISPR” and Unintended Consequences. Sitting Andrew DuFresne and Robert Cook-Deegan. Participant Helen Levy-Myers and Katina Michael holding up their poster with Ethan S. Burger and Zachary Pirtle looking on considering the theme of “Alternative Transportation and Unintended Consequences”. Representation at this conference included delegates from NASA, FBI, Geo/4TEKK, Virginia Tech, BlueStreams Group, FCT, AAAS, Georgetown University, American Institute of Physics, Institute of World Politics, Stuck in the Sand, VT, Catholic University, Arizona State University, GAO, Consortium of Social Science Associations, ISIEC, Eth Global, BLS, USPAACC, DJG Communications LLC, AAAS-NIJ, BTS Software Solutions, Climate and Land Use Alliance, Massachusetts Institute of Technology, Athena's Workshop, NIH, USGov, United States International University - Africa, Central China Normal University, Tech 2025 (Served Fresh Media), Well Mind Association of Greater Washington, Booz Allen Hamilton, California University of Pennsylvania, NPP Uralelektra, Cal Poly, Technestar, George Wasington University, University of Baltimore, Arizona State University - International Development, BluSky Consulting, Law and Security 2.0, SURS, Georgetown University School of Foreign Service, Naval Postgraduate School, and University of Maryland. If not for the first snowfall in DC the room would have been packed. Local schools closed however, and we had some major disruption in people getting to us at ASU in DC. I can say however, that the people in the room, fluctuating between 10 and 20 people throughout the day, were all quality! Thank you for those who supported the event and braved the conditions to be on the road. We hope to bring the videos to you soon.